Tickets for the Spokane Shock game May 17 are available for $12 through the West Valley Band Boosters. For information about getting tickets to the games, email band director Jim Loucks at jim.loucks@wvsd.org, or call the school at (509) 922-5488. Most high school marching bands are used to performing during the halftime show of high school football games. West Valley High School’s marching band will take that to a new level May 17 when they perform during halftime at a Spokane Shock game. It’s the fourth time the band will make an appearance at a Shock game. Band director Jim Loucks said he and the band knew going in that the field would be shorter, but that wasn’t the only twist. “We didn’t realize it was half as wide,” he said. Working through the differences in size didn’t pose too big a problem and last year, Loucks said, they brought the house down with a performance of “Party Rock Anthem” by LMFAO. “The crowd went absolutely nuts,” he said. This year, the band is adding a twist to its performance. Joining the high school marching band, drill team, color guard and cheerleaders will be members of bands from district middle and elementary schools. “This is a three-ring circus,” Loucks said. He said blending the bands is a great way to recruit band members into the high school band, showing them the culture, the expectations and the excitement of a high school performance. Mostly, he looks forward to giving each student an experience they will never forget. Annika Esvelt, 10, a fifth-grade clarinetist at Pasadena Park Elementary School, is admittedly a little nervous about the big show. She is, however, impressed with the high schoolers. “They are so much better than us,” she said. The elementary students have been learning a lot from the high schoolers. Cora Campbell, 10, said one fellow flute player from the high school taught her how to hold her flute so her arms don’t wear out so quickly. 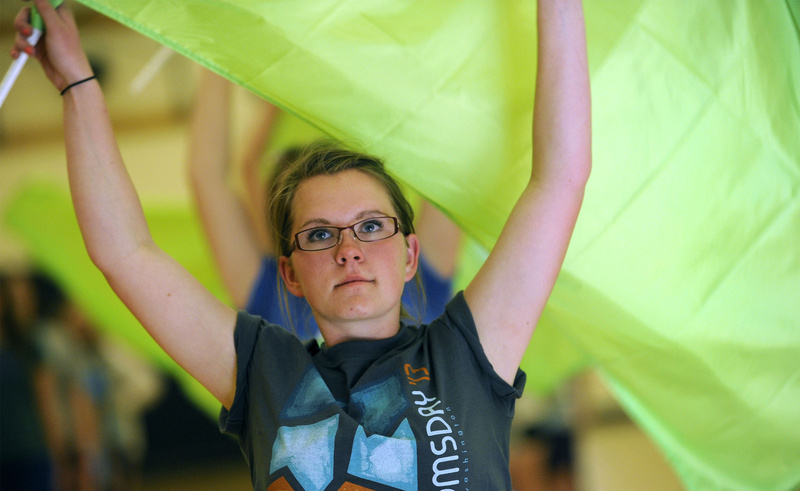 It’s a busy time for bands at the middle school level and at the high school in West Valley. The middle school students are performing in the Junior Lilac Parade this weekend. The high school band traveled to Wenatchee for the Apple Blossom Parade last weekend. The band took home a first-place trophy, beating bands in the AA division. The night after the Shock halftime performance, the band will be in the Spokane Lilac Festival’s Armed Forces Torchlight Parade. Loucks said developing leadership skills in the band is important. As part of this, girls in the high school color guard choreographed and taught a routine to the elementary students. “Just having great student leadership is a must for pulling something like this off,” Loucks said. While each group will have its own songs to perform, they will all group together for the finale of the halftime show – their version of Psy’s “Gangnam Style.” . All the students have been practicing long and hard, and for the elementary students who haven’t performed for a crowd this big, they are nervous, but not worried.